Located near the west coast of New Caledonia between Noumea and the international airport the site incorporates a diverse set of landscape types. Corkery Consulting was engaged by Dickson Rothschild to provide specialist landscape assessment skills and input to master planning for future development of the site. The landscape site analysis carried out by Noel Corkery provided the basis for a number of land use development scenarios that incorporate a mix of industrial, commercial, residential and recreation land uses. Conservation of extensive areas with high ecological values formed a key aspect of the concept plan options. 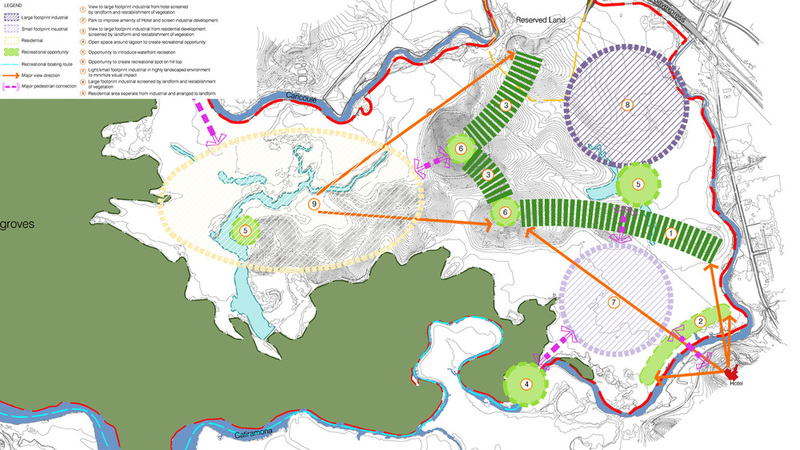 The 200 ha site presented a combination of opportunities and challenges. The diverse landscape incorporates Mangroves and tidal flats as well as grass-covered ridges with spectacular views to the coast and central mountain range. of residential types together with commercial and industrial employment opportunities. Access is provided for residents to extensive open space recreation areas including boating facilities that are connected to the coast.